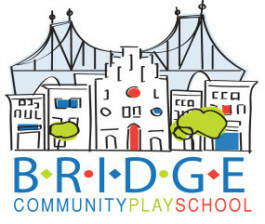 Bridge Community Playschool is a small, neighborhood school that nurtures confidence and responsibility in children while exposing them to the world through play-based learning. We believe strongly that children should be given opportunities to explore and discover at their own pace, without the added pressure to perform. We’ll nurture their natural curiosity and support their social/emotional, physical and cognitive developmental process in a personal way. It is essential to develop a good rapport with each child, and also with each parent, based on open communication and mutual respect. Additionally, we will encourage an open door policy that will allow parents to stop by at any time, and we welcome their volunteerism in the classroom whenever possible. We offer the option of a four or five morning program for our 3’s children. The four morning program is held from 8:45am-noon Monday, Tuesday, Thursday and Fridays. Our five morning program also includes Wednesdays from 8:45am-noon. The Pre-K class meets all five mornings. The school is open from mid-September through mid-June. Parents may also choose to extend their child’s day until 2:40 two, three or four afternoons per week for both 3’s and Pre-K children. Since children change rapidly during their first year of school, the extended day option is offered by semester, fall and spring. This gives parents flexibility to add, subtract or keep the same number of extended days depending on their child’s needs. Cost varies depending on the number of days selected — see our Admissions Tab for details. Every child is guided through play-based and experiential learning by passionate teachers who understand the range of developmental levels of preschoolers. Small class sizes and an ideal student-to-teacher ratio enables the teachers to have a powerful impact on each child’s development by giving them the individual attention that is essential during their early years. Each classroom is supervised by a head teacher and supported by an assistant teacher. All head teachers hold or a working towards a master’s degree in education, and all staff members are selected because they best represent the mission and educational philosophy of Bridge Community Playschool.